The Rundown: Woo hoo! 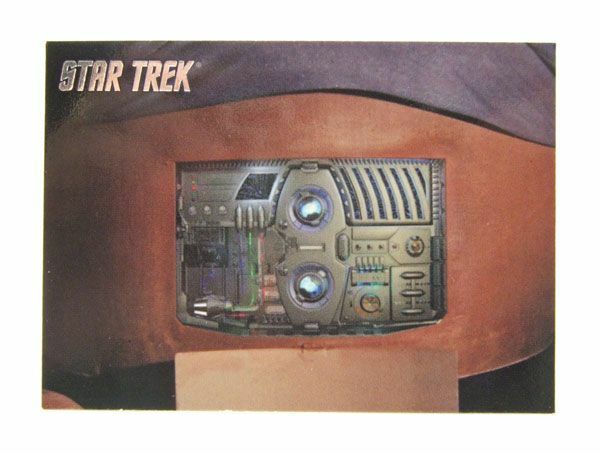 New Star Trek trading cards! 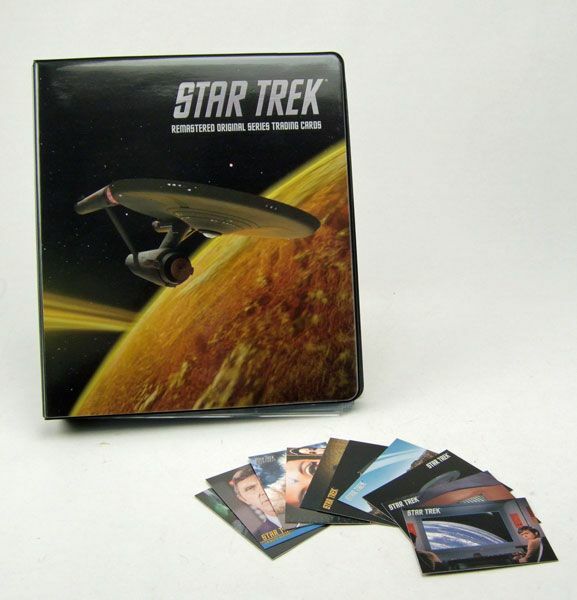 In case you are new to the blog, I should let you know that one of my favorite Trek items to collect is the trading cards. I love the old stuff from Topps and Leaf, but the new releases from Rittenhouse Archives really get me jazzed. I usually go pretty nuts on each new release, buying multiple boxes in attempts to put together my set and snag any new autographs that might be available. The new set just hit a week or so ago.... Let's take a look at it! ...to reworked effects like Norman's belly there. The imagery is quite clear on each card, and presents a nice look at the work that went into the remastered episodes. 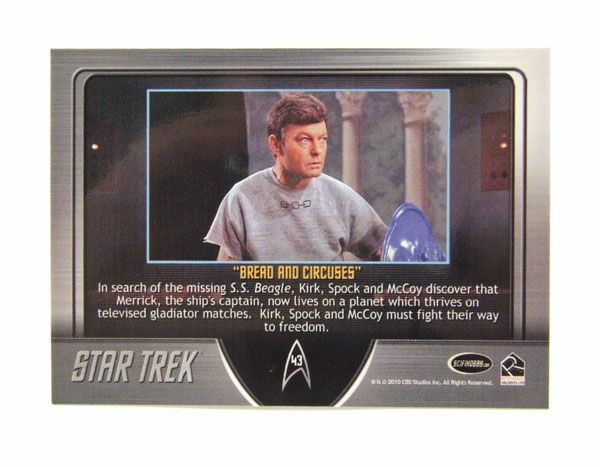 On the back of each card is a brief synopsis about the specific episode featured. It seems like many of the new card releases don't offer much info on the card backs anymore, so it's really nice to see these episode rundowns included. Sure, it's stuff that we old fogeys already know, but it's a great inclusion for those who aren't as familiar with each episode. If you buy a box of these, you're pretty much guaranteed to get a full basic set; The subsets are where the real fun begins. There are 4 regular subsets (plus another special set we'll get to later) included here. First, there's 18 "Tribute Cards" like the one pictured above. 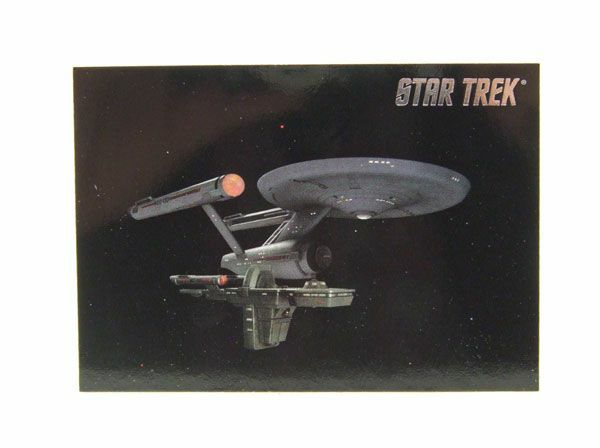 Inserted 1 in every 6 packs, these card continue a subset from the 2009 Star Trek TOS set. 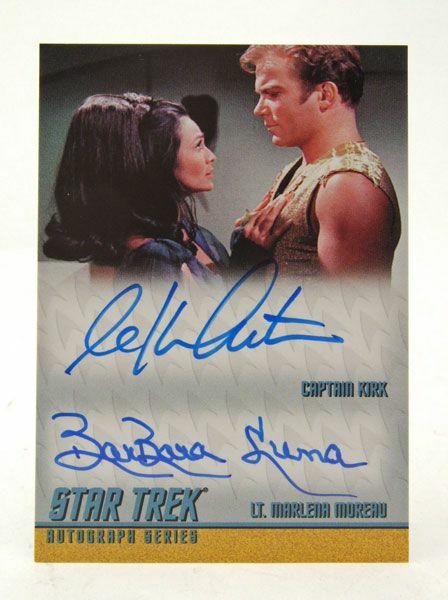 The design of these cards is based on the traditional TOS autograph card styling, but each features actors and actresses who have passed away. Since we'll sadly never be able to get autograph cards from these folks, it's nice to have something similar featuring those characters (especially Gary Seven... who is awesome). Next up- A 9 card "Creatures" set packed in at 1 per every 12 packs. 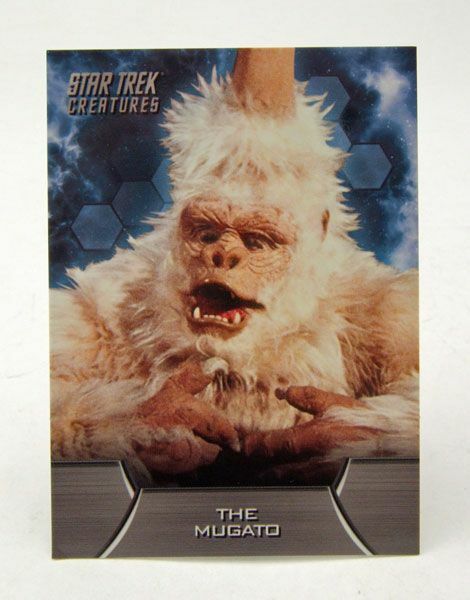 These cards depict 9 of the zany creatures featured in the original series. While I dig the choices they made here, the design of the card isn't quite to my liking. I would have preferred a little more "vintage" styling, but that's just a personal choice. The last 2 subsets are pretty difficult to complete (I still need a few myself), with only 1 card each per box! First, there's the 9 card "Elaan Of Troyius" revised set. 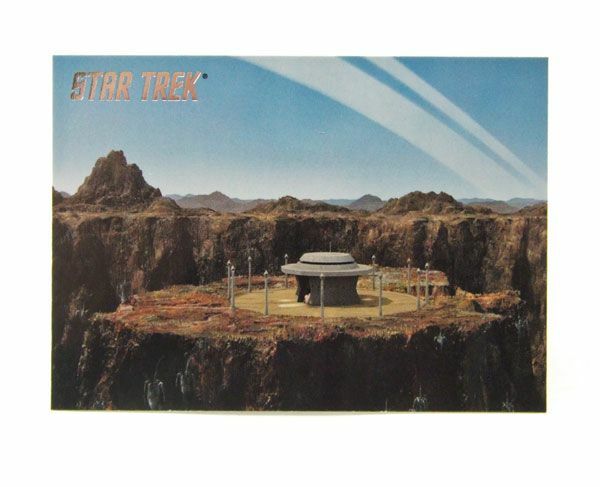 Each of these cards is designed to fit into the old Skybox Star Trek season 3 set. 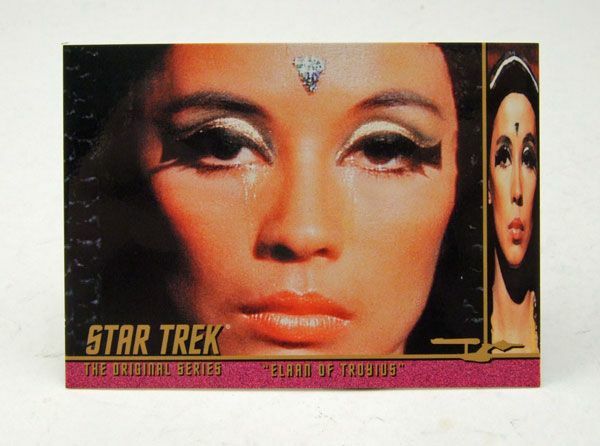 The numbering is the same as the "Elaan" cards from that set, but these new versions now feature pictures of France Nuyen (which I believe the original versions lacked). A cool subset, but pretty tough to put together. Rounding out the subsets is the 9 card "Ships In Motion" set. 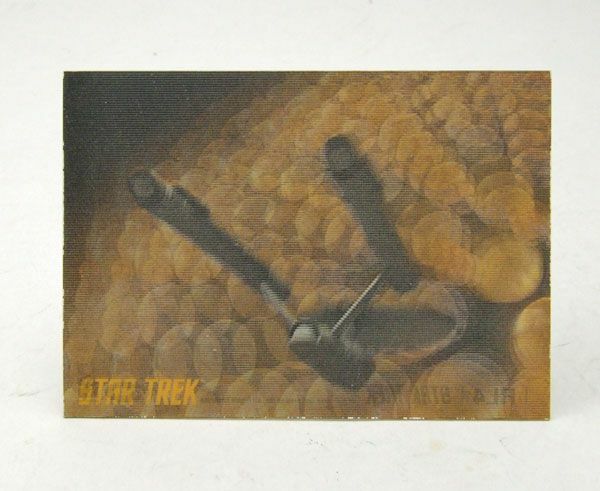 All of these cards feature a lenticular image of a ship scene. 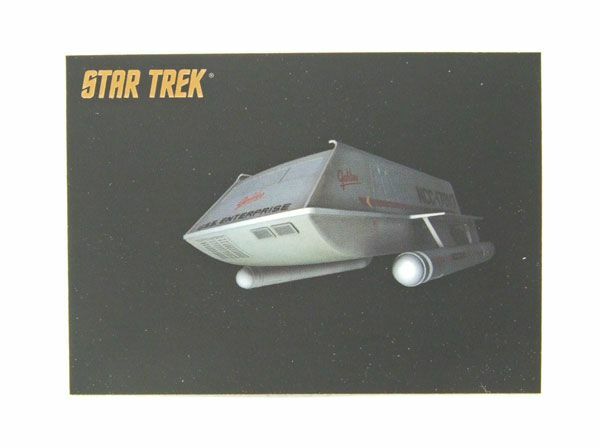 Tilt the card a bit and watch as the Enterprise magically "moves" across the card! Rittenhouse does lenticular better than anybody in the business, so this subset is FANTASTIC. But again, like the "Elaan" subset, these are only 1 per box, making completing the set quite a chore. Adding to the difficulty is the fact that there are actually 2 additional lenticulars available outside the set. The tenth lenticular card is only available as a case topper, and the eleventh is only available HERE through the Rittenhouse Rewards program. So yeah, that one's going to be tough to finish off. Now here's something I didn't expect in this set. Not featured on the Rittenhouse website checklist, the set also includes 81 parallel cards! 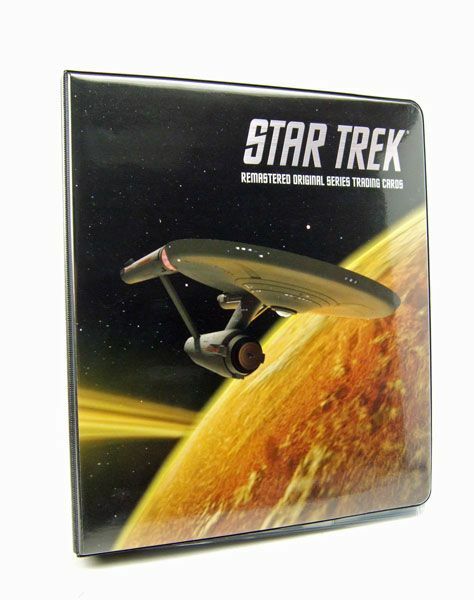 It's the same imagery and info as the basic set, only these feature a gold foil Trek logo and a flatter finish to the front. I have no idea how many of these there are per box (I should have kept better track when opening), but I ended up with around 40 cards out of the 5 or so boxes I opened. Trying to complete a full 81 card parallel set is going to be a monster, but I really dig the flat finish used on these so I'm going to give it a shot. Anybody out there trying to do the same? If so, hit me up and maybe we can do some trading! Now here's the real highlight of the set- Autographs! Trek autograph collecting is my biggest passion (check out the still-in-development Trekautographs.com for more on this). With their guarantee of authenticity, Rittenhouse's autograph cards are my preferred method of signature collecting. This new set features 2 different types of autographs, each at one per box. 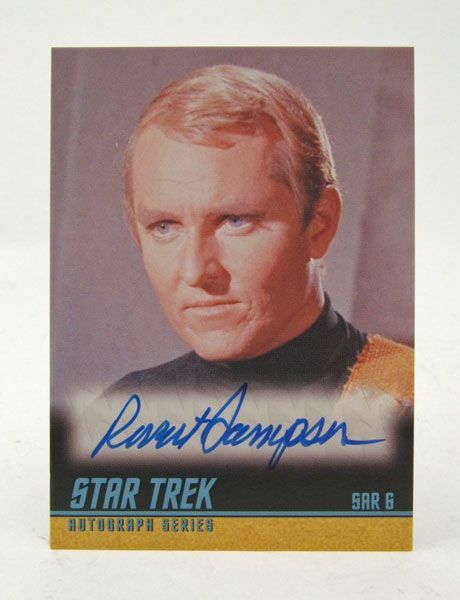 11 of the cards feature a single autograph like the one pictured above. I believe that 8 out of the 11 feature first-time signers, so that's a big bonus for me. Kudos to Rittenhouse for going after EVERYBODY in the show, no matter what the size of their role! The other autograph cards in the set feature dual autographs. Each of these cards depicts a scene from the show featuring 2 actors or actresses, with both personalities signing the bottom of the card. While there are no first-time signers included here (boo hoo for me), I really love the choices that Rittenhouse made for these. Pairings include Kirk with Marlena, Koloth with Korax, and Commodore Mendez with Captain Pike to name a few. 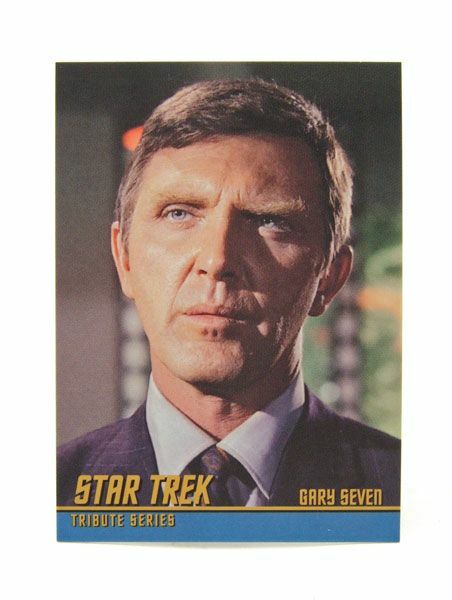 There's even one featuring Leonard Nimoy and Majel Barret (the final card that Majel signed before passing away). Awesome stuff. Oh... and in case you need something to put these in besides the spokes on your bike, Rittenhouse made this handy-dandy binder for ya! The binder retails for around $30 and includes an exclusive promo card. As a long time Trek card collector, I really couldn't be any happier with this set. While a couple of the subsets may be a bit of a pickle to collect, the overall look of the cards and the fantastic autographs make buying multiple boxes worthwhile. If you're thinking about giving Trek cards a chance, this would be a great place to start. The cards should be hitting your local comic and non-sport card retailers now, so pop in and pick up a couple of packs! Hey, your awesome review made me want to collect these! Lucky for me I'm in San Francisco for the Star Trek Convention. Great Review, again. But, does that mean you need to buy 9 packs to complete the "Elaan of Troyius" Set?! I'll be out of money by the end of the week.